Please help me decide what colour scheme to go for? Discussion in 'Art & Design' started by sweet_n_simple, Mar 13, 2009. By the way, the center bit is indented. Also, what roof/grout/gutter/window colour would you suggest? What kind of impression do you want the house to make? Also I wonder if there is greenery nearby or other houses, buildings.. or the amount of sunshine the area gets. It will affect how the colour is perceived.. I just want the house to look classic and not to look outdated in 15/20 years time. There isn't much greenery at the moment but there will be grass etc once the landscaping has been done. i agree with gius, i think the red gives it a school kind of feel. if you want something like the colours you posted, i would suggest the very first picture you posted but maybe with a different colour for the centre, something darker to match the roof. I like red bricks, but they are are traditional colour brick over here so it does make the houses look less aged IMO. What are the other houses around you like? i think blond or any lightened brick is pretty dated to this decade. every McHouse i've ever seen is that color. i prefer the red. it's statelier. i didn't think "school" right away, but i see what you all mean. i think the black and white trim work to make it seem less institutional though. - - a grayed-white or ivory building with black window panes and trim to match the building. With a timeless theme for the structure, landscape really "pops" - green shrubbery takes on a very rich green in appearance. Also, an understated color on the structure permits you a very wide range of color for flowering shrubs and / or the flowers that you choose to plant. I really like the first one, even though you cant really tell from the pictures but out of those 3 i like the first but maybe a bit darker.. So its going to be a brick house? What colour roof were you thinking? 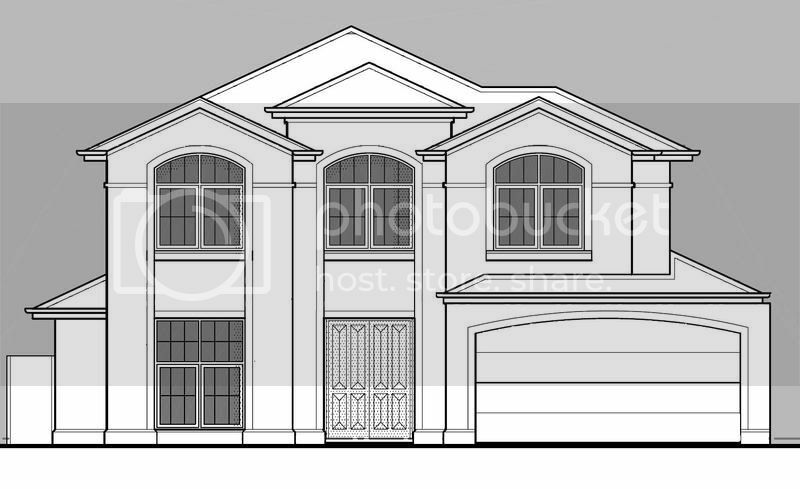 Oh, the first one is just the outline of the house, with no colour schemes applied to it. Yes, it will be a brick house and we won't be rendering it. The roof... we are leaning towards black or charcoal tiles. Do you guys think that the two tone brick colour would date very quickly? What do you think? Or would you stick to just one color all over? IMO i would stick to one type/colour brick but if you have any pics of real life houses with the 2 bricks to show us that would be great I cant picture it but maybe it looks better in real life? The roof... we are leaning towards black or charcoal tiles. Dark colors used on the roof will cause the tiles to absorb heat from the sun and hold it for a longer period of time. This becomes important during the heat of the summer. If you live in an area where the summer sun is intense, it will be far more effective in cooling your home to install a lighter color roof tile. With bedrooms on the second floor, the upper floor can be unreasonably hot as a result of the dark tiles. While the dark color might be pleasing to the eye, the energy costs could be crippling. I too loved the look of the darker roof tile, but for the reasons of energy cost, I installed a light-medium gray tile. What do you think of my updated single colour designs? Do you mean Pic 2, 3 or 5?